Please Note: Photos from Ideal Photos are ONLY available at the State Championship Event! 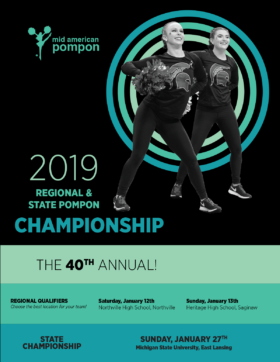 Each year, Mid American Pompon hosts the Michigan State-Wide Pompon championship, open to all middle school and high school pom or dance teams from the State of Michigan. Two regional competitions are held where teams compete in an effort to qualify for the State-Wide Championship in February (held at Michigan State University). Each team decides which regional competition they will attend. In addition, collegiate pom teams are invited to participate in the State Championship Competition. The teams are judged and ranked by total points. Appearance; Form,Execution; Skill Level of Ability/Talent; Formations/Transitions; Skill of Kick line; Choreography; Use of Poms; Team Unity, Precision, Rhythm and Timing; Smiles and Showmanship; Overall Impression; and Mistakes.